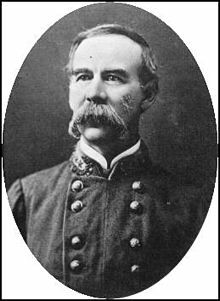 Today in Masonic History Joseph Benjamin Palmer is born in 1825. Joseph Benjamin Palmer was an American politician and soldier. Palmer was born on November 1st, 1825 in Rutherford County, Tennessee. He was orphaned as an infant and was raised by his grandparents. He attended Union University in Murfreesboro, Tennessee. In 1848 he was admitted to the bar and began practicing law. In 1849, Palmer was elected to the Tennessee General Assembly where he served for two consecutive terms. In 1855 he was elected mayor of Murfreesboro, Tennessee. He served as mayor until 1859. In 1861, Palmer followed his home state and joined the Confederate cause. He organized a company of soldiers which became part of the 18th Tennessee Infantry. He was elected Captain of the company and by June of that same year was elected colonel. Palmer fought mostly in the Western theatre of the war. He and his company were captured when they surrendered at Fort Donelson in 1862. Later that same year they were traded in a prisoner exchange. After that Palmer was given a Brigade in the Army of the Mississippi. He fought in several battles and was wounded in two of them. He was wounded twice in the right shoulder in two different battles. After his second wound to his shoulder he was considered medically unfit to serve and was appointed to what amounted to a desk job while he convalesced. Eventually he returned to service as a brigadier general. He continued to serve all the way until the end of the war. After the war, Palmer was pardoned by the United States Government. He returned to Tennessee to continue his law practice. Despite several requests for him to run for governor he never re-entered public service. Palmer passed away on November 4th, 1890. Palmer was a member of Mt. Moriah Lodge No. 18 in Nashville, Tennessee. He was also a member of Pythagoras Chapter No. 23, Royal Arch Masons where he became high priest. He was Knighted in Nashville Commandery No. 1 Knights Templar and later became a charter member of Murfreesboro Commandery No. 10, where he served as Eminent Commander. In 1872 he was the Grand Commander of the Grand Commandery of Tennessee.